The Wild Pear Tree (2018). Venice, Telluride, and Toronto get a great deal of attention, since obsessive, year-round Oscar-predicting has become a way of life for some reviewers and industry commentators. In contrast, Vancouver has few premieres, but it quietly gathers up a huge international range of films, most of which have already played other festivals. It offers a chance to see fine films, many of which will never enter the radar of those who search only for Oscar bait. Venice and Vancouver, the two VIFFs, offer a perfect combination to keep us up-to-date. There are several major threads in the program, including documentaries, socially impactful films of all sorts, Canadian films, and so on. I tend to favor the Panorama: Contemporary World Cinema thread, since it’s the one that basically breaks down the ROW (the Rest of the World) by country, and I try to see a wide range of world cinema. It’s also where familiar auteurs that I follow tend to show up. This entry covers three films by directors whose work I have seen and admired, representing Iceland, Turkey, and Poland. More ROW films to come. Four years ago David reported on Icelandic director Erlingsson’s first feature, Of Horses and Men. This year we enjoyed his second, Woman at War. It tackles the difficult task of making a heroine who is basically a terrorist, though one might more tactfully call her an rather extreme environmental activist. We first see her taking out the local power grid by firing a wire via bow-and-arrow over power lines in a remote rural area (above). She’s resisting a large Chinese investment in Iceland’s infrastructure, and she seems to be succeeding. The Chinese have postponed the deal, but she carries on her nearly one-woman crusade, aided only by a government official who is getting cold feet as the search for the “Mountain Woman” saboteur escalates, and an “alleged cousin,” a gruff farmer who rescues her more than once. David praised how visually Erlingsson told his tale in Or Horses and Men. The same is true for the long scenes of Halla’s forays into the countryside for her subversive errands, as well as her preparations. She is clearly a highly adept and well-equipped saboteur, and she’s bold and skilled enough to outfox the military pursuers who send helicopters and drones after her. Despite the serious theme, Woman at War is a lighthearted film. As Variety reviewer Jay Weissberg put it, “Is there anything rarer than an intelligent feel-good film that knows how to tackle urgent global issues with humor as well as a satisfying sense of justice?” One could called Halla a terrorist, but the audience we saw it with was clearly on her side, hoping for her to escape at each narrow brush with the law. The whole thing is funny enough to be termed a comedy, or at least a dramedy. Halldóra Geirharðsdötter makes Halla an irresistably likeable character, and Erlingsson gives her emphatically ladylike activities in her life outside her clandestine campaign: she conducts a local choir and is in the process of adopting a Ukrainian orphan. One daring move that Erlingssohn makes is to put the musicians playing the accompanying musical track onscreen, both a chamber group of three male instrumentalists who crop up nearly everywhere Halla goes, and a trio of female singers in Ukrainian dress who appear in scenes relating to the adoption. At first this seems like a joke simply repeating the one early in Blazing Saddles where the hero rides past Count Basie’s Orchestra playing the apparently nondiegetic sound track in the middle of a desert. Here the musicians appear through most of the film. They help avoid having Halla alone onscreen for long stretches of time, they appear sympathetic to her changing situations and hence cue us to sympathize with her, and they provide part of the film’s comedy. They took some getting used to, but I think the “onscreen nondiegetic music” device worked overall. Shortly after its premiere in the Critics Week thread at Cannes, Woman at War was picked up for North America by Magnolia Pictures. Audiences should give it a look, since it’s a real crowd-pleaser. My entire knowledge and admiration of Turkish director Ceylan’s work come thanks to VIFF. In 2011 we wrote about Once upon a Time in Anatolia and in 2014 about Winter Sleep. This year The Wild Pear Tree is being shown. It’s a very fine film, though I doubt audiences will embrace it to the extent that they did Once upon a Time in Anatolia or even the less popular Winter Sleep. The former may have qualified as slow cinema, but it had the advantage of being a mystery centered around a murder and a lengthy search for the missing body. In the process it became a character study and a quiet satire on the police. Winter Sleep was more talky, but it featured arguments between two witty people, a crotchety ex-actor and his acerbic sister. In The Wild Pear Tree, Ceylan tackles the challenge of another film with long conversations. But this time the plot centers around Sinan, an opinionated, bitter, argumentative recent college graduate returning to his hometown. He is, in short, an obnoxious protagonist, and we’re attached to him in nearly every scene. He argues with his father, a teacher with a serious gambling addiction that has impoverished the family, with his mother, whom he blames for putting up with his father’s problems, and with essentially with anyone else he encounters. Sinan’s stated goals are simple: to publish a book of his own poetry and fiction and to become a teacher in the eastern part of Turkey, as his father had early in his career. He also reluctantly faces performing his required military service. Yet he doesn’t study for the teaching exam, perhaps out of laziness or perhaps because he fears following in his father’s footsteps. The result is a film that I found more admirable than likeable. Certainly its portrait of Sinan captures a certain recognizable type of self-assured, stubborn character, and there is a certain humor in that portrayal.. The highlight for me was a lengthy conversation between Sinan and Mr. Süleyman, a successful local novelist whom he spots at work in a local bookshop. Receiving permission to ask a single question of the man, he sits down and proceeds to question him at length, in the process managing to imply that he knows more about writing than Süleyman does. Sinan even pursues him out of the store and down the street, arguing, until Süleyman finally loses his patience and berates the young man. Any professor will recognize this spot-on depiction of a tiresomely persistent, argumentative student. I found the ending a bit too pat and easy. Sinan’s military service, rendered in one relatively brief shot, apparently purges him of much of his anger with his life, and the final reconciliation with his father seems to come far too easily. The film is beautifully photographed (see top), as always, by Gökhan Tiryaki, this time using a Red 6K digital camera. Cinema Guild plans an early 2019 release for the film in North America. Polish director Pawel Pawlikowski’s first feature film since the award-winning Ida (2013) is quite a departure from that film’s austerity, despite again being beautifully filmed in black-and-white film with an Academy aspect ratio. It follows the tempestuous relationship between a young singer and the composer-pianist who mentors her and becomes her lover. The backdrop is the era from 1949 to the mid-1960s, set mostly in Poland but moving among the European cities that the pair visit, alone or together. Cold War establishes an immediate appeal by showing a man, Wiktor, and his partner Irena (professional and perhaps personal) making ethnographic recordings of untutored peasants singing and playing traditional folk songs. The pair join the faculty of a state school for young singers, instrumentalists, and dancers. One auditioning singer, Lula, attracts Wiktor, and the two are soon involved in an affair that lasts, on and off, until the end of the era. The film’s first half is fascinating, with its presentation of Polish folk-songs and dancing. The troupe formed by the school’s students becomes a success by presenting more professionally rendered versions of the folks songs and dances that had been collected. 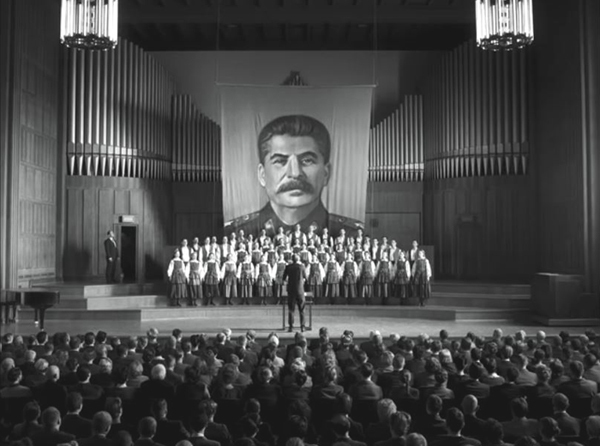 It soon attracts the attention of Communist authorities who pressure the Wiktor, Irena, and the manager, Kaczmarek, to add pro-Stalinist numbers to their program, and soon the group is singing “The Stalin Cantata” to equal success (see bottom). Scenes fade to black at intervals, with the new scene appearing with a title giving the time and place of its action. These temporal jumps forward become more frequent as Wiktor becomes disgusted with the government’s control over the group’s program and flees to Paris. Thereafter the original troupe is left behind, and we see a series of scenes in which Lula’s path crosses Wiktor’s. The result is that the second half of the film seems sketchier and less interesting. The action repeats, with variations, and the music that the pair perform is more familiar. The highlight of this late part of Cold War is a scene which breaks loose briefly from the lovers’ travails. 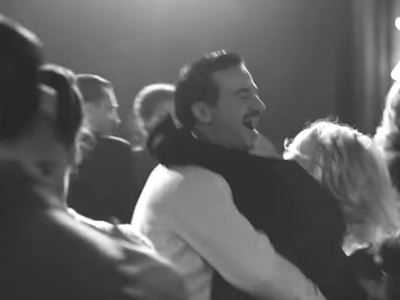 Lula and Wiktor at in a bar, and she, thoroughly drunk, initially begins to dance by herself to “Rock around the Clock.” In a remarkable long take, the camera moves among the wildly dancing couples as Lula passes from one partner to another and other couples pass by in the foreground and background (above). The moment must have been carefully choreographed, with the camera always capturing key moments of Lula’s enjoyment of the music, while simultaneously suggesting spontaneity and the crowd’s utter abandon to the music. Cold War‘s music has been singled out by reviewers as a crucial ingredient. The film begins with craggy peasants performing genuine folk music in a muddy street and eventually takes us to Lula tarted up in a black wig and sequined dress singing a bizarre Polish version of “Baio Bongo,” a popular South American import deemed safe for audiences in the Soviet sphere. In between there are folk songs and dances, Stalinist choral propaganda, jazz, torch-song versions of the folk songs heard earlier, and rock-and-roll. The film provides almost no background information about the two main characters or what they do in the several temporal gaps, some years long, covered by those fades. This makes it difficult to sympathize deeply with Wiktor and Lula’s long, ill-fated romance. Pawlikowski in fact concocted some backgrounds for them, which he discusses in the film’s pressbook (posted in its entirety on Antti Alanen’s blog) .It draws upon extensive quotations from the director. There is considerable information about the historical, political context, including the fact that Wiktor and Lula are based on his parents. There is also discussion of the music, cinematography, and casting. Very often films, especially biopics, are weighed down by the need to feed information and explain; and the narrative is often reduced to causes and effects. But in life there are so many hidden causes and unpredictable effects – so much ambiguity and mystery that it’s hard to convey it as conventional cause and effect drama. It’s better to just show the strong and significant moments in the story and let the audience fill in the gaps with their own imagination and experience of life. Reading the pressbook, I found myself wishing that at least some of the information therein could have been included in the film. There certainly would be time, since Cold War runs about 80 minutes sans its credits. Amazon acquired Cold War for North America last year after its premiere at the Berlin Film Festival. It has announced a December 21 limited theatrical release.